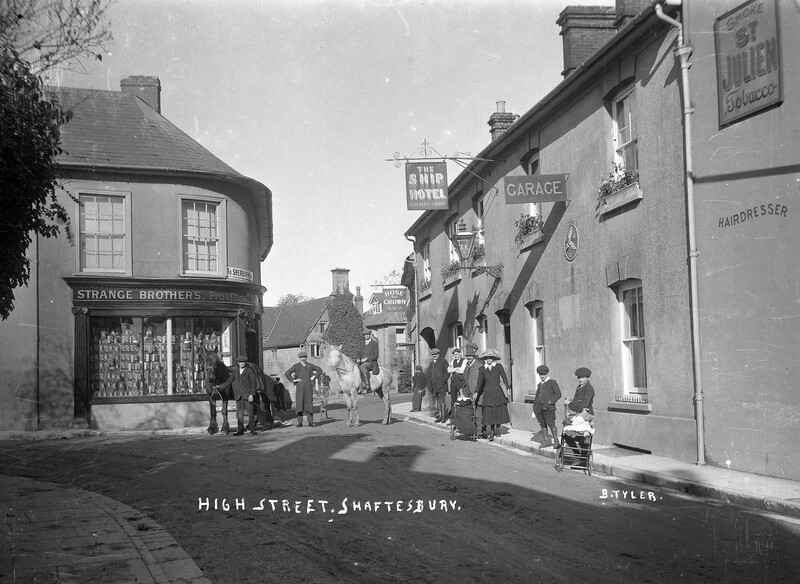 At the beginning of the 20th century, Shaftesbury was a busy commercial centre for the local area, offering a wide range of shops and services to townspeople and those living in the villages and on farms. In 1911 the Post Office was in the Commons, offering a comprehensive postal service and ‘Telephonic Express Delivery’, including collections and deliveries on Sundays. There were also two sub-post offices in St James and Enmore Green. An omnibus ran regularly from the Grosvenor Hotel to Semley Station, meeting almost every train. There were nine carriers for goods to and from the station, most of them operating only on Saturday, market day. In 1911 Kelly’s Directory lists ten public houses, catering for the crowds on market day, and for travellers and locals in the town. Many shops were also manufacturing businesses, such as bootmakers (6), bakers (5), carriage builders (3), a sadler (1), watch and clockmakers (2), and artificial teeth makers (2). 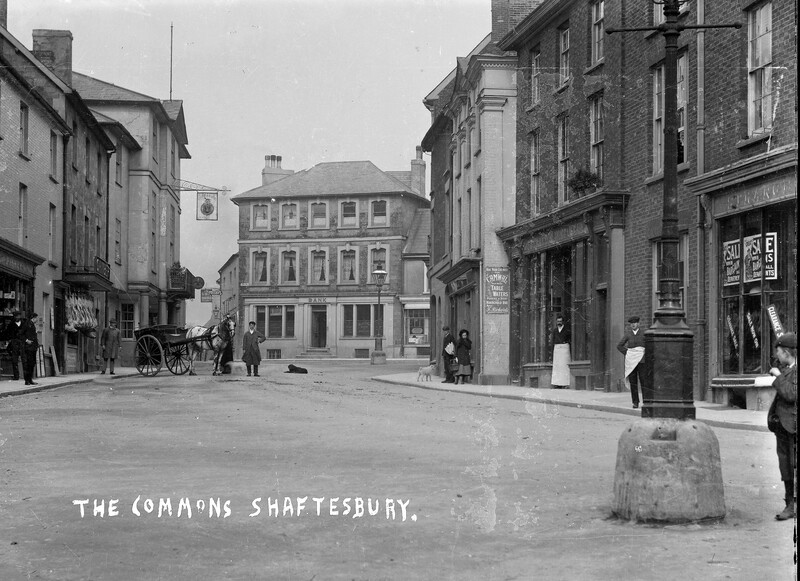 There were two chimney sweeps in Shaftesbury, one of whom was a woman. There were a few large scale businesses, such as Stratton, Sons and Mead, who were wholesale grocers and provision merchants and also owned the Mineral Water Works on Barton Hill; Shorts coach and carriage builders on Angel Square; Shaftesbury Gas and Coke Company in Bimport; and G.E. Johnsons, who were cabinet and furniture makers, undertakers and removal men. The 1915 and 1920 Kelly’s Directories show little change in the number and types of business. The main difference is the adaptation of coach and carriage establishments to cater for an increasing number of motor cars and bikes. 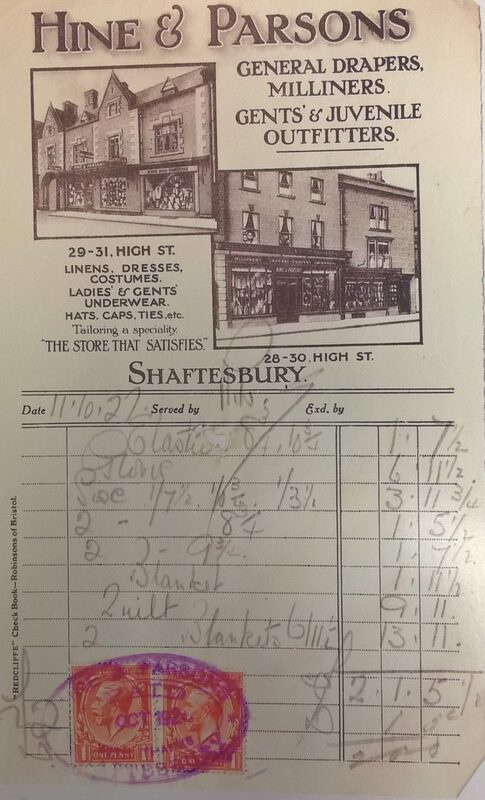 F.C Long writing about Shaftesbury in the early 1910’s, records that Stratton Sons and Mead was a very fine business, employing upwards of twenty men and boys. Heavy horses were used for delivering goods, and the business kept eight carthorses, a cob and two ponies. Groceries were collected from and delivered to destinations as far away as Bruton. They were loaded at 8 pm and the carts set off at 6 am the following morning, returning by 8 pm in the evening for the next loading. All goods were weighed and bagged or wrapped. Salt came in bars which had to be chopped and wrapped. Sugar arrived in 2 cwt sacks, tea in 1 cwt boxes and spices and pepper in 1 cwt barrels, all needing weighing and packaging. Eggs were delivered in cases of 30 dozen, and several hundred cheeses in the store had to be turned daily. Harold Viney was the manager, and one of the three members of The Syndicate which bought the town in 1919. In Salisbury Street, Charles Hull ran his dairy implement business, making and supplying the local farms with milk buckets and tools. The clockmaker in Salisbury Street, George Hillier, used to walk miles to the large country houses to wind up and repair their clocks as well as running his business in the town. Shorts coach-building business in Angel Square employed up to 20 men and was the first place in town where petrol could be bought in cans. The business later became a garage. One of the most popular shops in town was the tobacconist and barbers’ saloon, run by John and Bill Peach at the bottom of the High Street. Further up the High Street, Mr Cordery ran a drapery establishment, and you can still see his name in mosaic on the shop entrance. In the passageway, Mr Billy Baker sold oranges, rabbits, bloaters, smoked haddock, and a salt fish known as “blacksmiths’ aprons”, because it was so tough. On the opposite side of the street was ‘The World’s Store’, replaced by the Picture Palace in 1912. 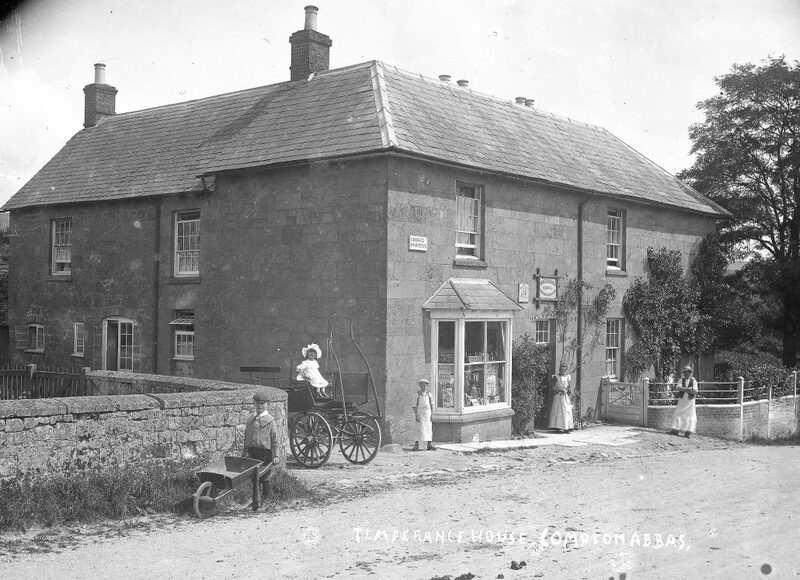 This in turn was demolished in 1925, and replaced by a bicycle shop. A drapery business has been on the Hine and Parsons’ site since the early 1900’s, and they employed women to make and alter clothes as well as selling ready-made goods. 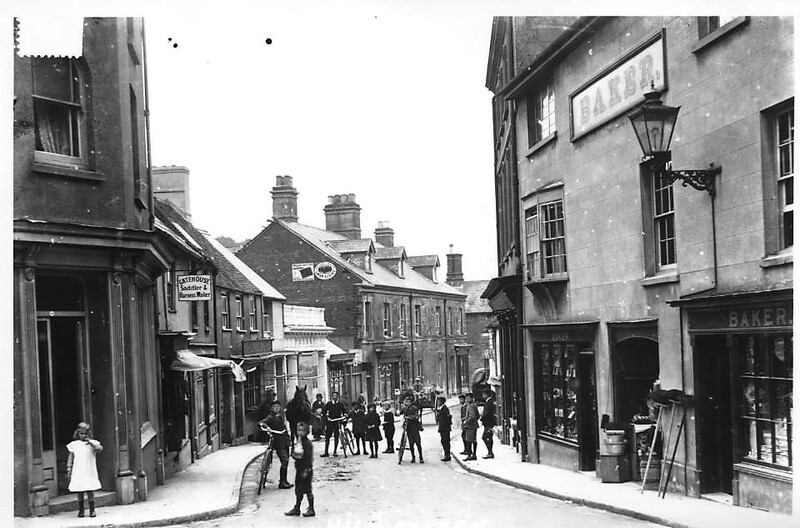 G.E.Johnson’s Antique and Furniture shop was an old established firm in Shaftesbury, and during the Great War, the ground floor was used as sleeping quarters for some of the men stationed in the town. John Bragg’s clothing business (where Squire’s is now) supplied most of the clothes for men and boys with ‘the average pocket’. On the right hand side of the Town Hall was a coach-building business, which later became Pike and Badgers garage, and there was a blacksmiths on the corner of Park Walk opposite The Manse, which later became the Scout Hall. King Alfred’s Kitchen was a very old-fashioned shop selling a higgledy-piggledy mix of sweets, faggots, black puddings and candles. Next door, where Barclay’s Bank is now, was a bakery owned by Charles Stretch, who also owned the grocery business in Bell Street. The bake-house was under the shop, and delicious smells came out of the grating in Church Lane. The Grosvenor Hotel, owned by Robert Borley, another member of The Syndicate, was a first-class hotel, and before cars were common, there were many inns and pubs in the town offering accommodation to visitors and their horse-drawn vehicles. Along the High Street one can still see several large gated arches which used to lead to yards and stables behind the High Street where horses could be rested or kept overnight. 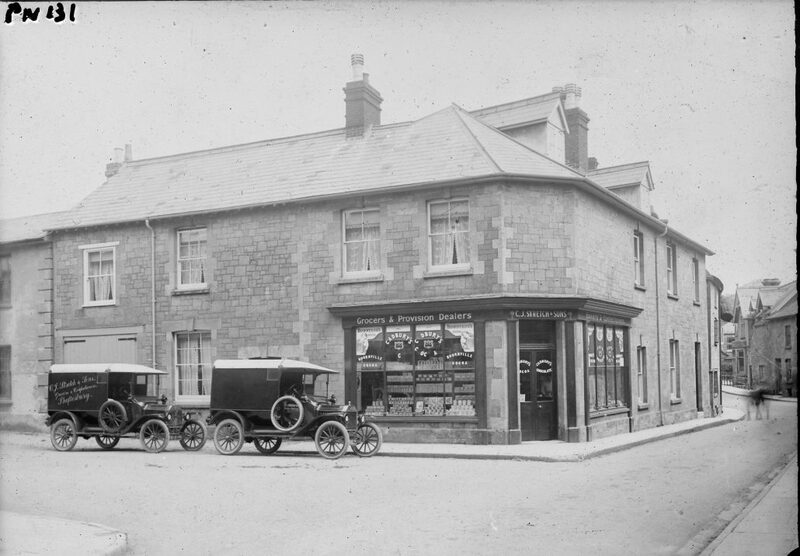 Shop in Compton Abbas which also served as the temperance house.